Preheat oven to 350 F. Lightly grease 9x13-inch baking dish with non-stick cooking spray. Cook and drain the spinach. Soften the cream cheese. 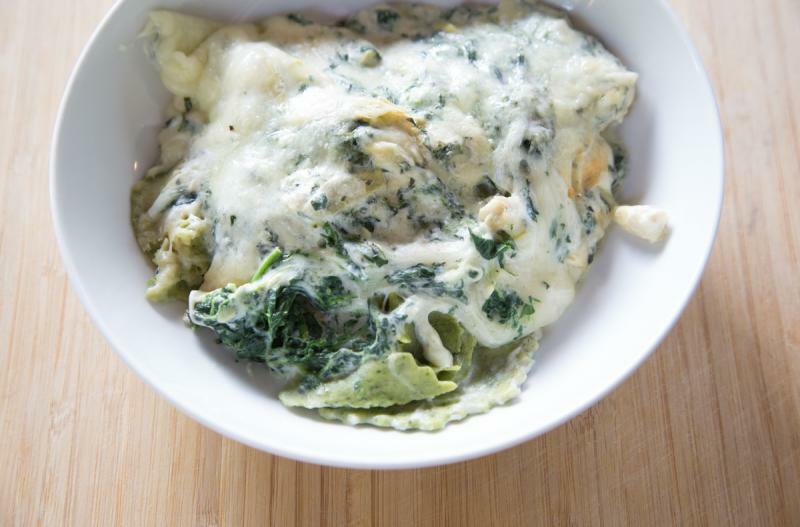 In a large mixing bowl, add the Parmesan cheese, mozzarella cheese, spinach, cream cheese, and artichoke hearts. Mix well. Place the ravioli into the base of the baking dish in a single layer (as best as possible). Pour and spread the artichoke sauce over the top. Sprinkle the shredded cheese on top of that. Pour in the hot water around the edge of the baking dish, so the water gets down underneath with the ravioli. Bake in the preheated oven for 25 minutes, or until ravioli are swollen and cheese is melted on top. 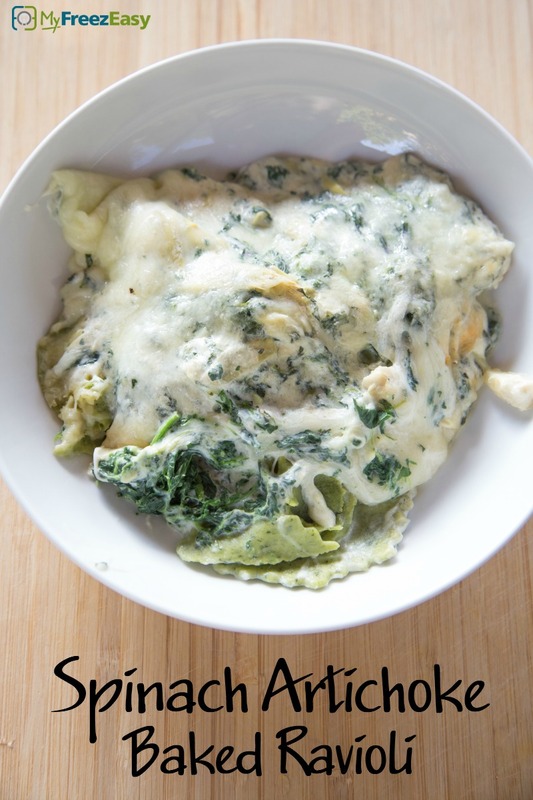 Serve Spinach Artichoke Baked Ravioli with side salad. Cook 2 boxes of spinach, and drain well. Do NOT add the hot water before freezing. Put tray in the freezer and freeze up to 6 months in fridge freezer or 12 months in a deep freezer. Thaw in the fridge overnight, or a warm shallow dish of water for about 20 minutes, before adding the hot water around the edge of the dish, and then baking as directed. Thaw completely and add hot water around edge of the dish, so it gets down below with the ravioli, and then bake at 350 F for 25 minutes.